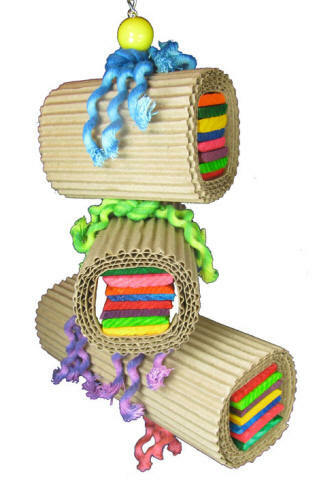 Triple Stack has three bundles of stacked, thinly sliced, colorful, chewable wood that is wrapped in corrugated cardboard. Triple Stacked is strung on nickel plated welded chain, has some colorful cotton rope for added chewing fun and a colorful plastic ball for motion. There is a nickel plated pear shaped quick link for easy hanging and if your parrot loves shredding wood and cardboard, this will be three times the fun! !